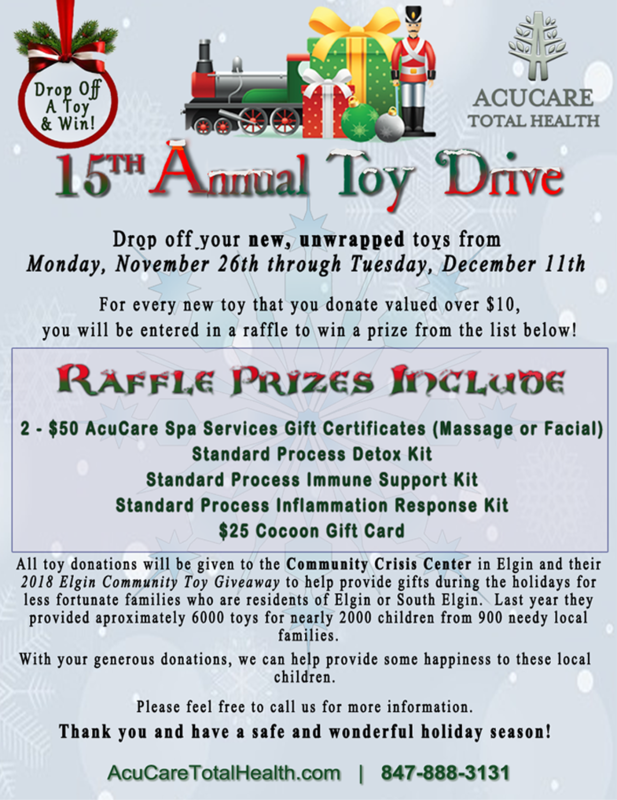 AcuCare Total Health is pleased to partner with the Community Crisis Center in Elgin, Illinois and their 2018 Elgin Community Toy Giveaway to help provide toys to families with children that may not be able to afford holiday gift giving for their family. We’re proud to state that this is the 15th year that AcuCare has been able to offer our Annual Toy Drive. More information about the Elgin Community Toy Giveaway can be found here . Alternatively, feel free to obtain more information by calling the AcuCare Total Health office at 847-888-3131. We’re seeking New, Unwrapped Toys for children of all ages with a value of between $10 to $30. If you’re unsure about what kind of toys to provide, take a look at the Community Crisis Center’s suggested Toys donation page. There are several items listed that are in high need. Monetary Donations are also accepted through the above links. AcuCare Total Health is accepting Toy Donations through December 11th, 2018. As a special gift to those donating through the AcuCare Total Health office, we’re happy to announce our Annual Toy Drive Raffle! You’ll receive a raffle ticket for each Toy Donation (of a value over $10 ). Winners need not be present to win. Be sure to fill out your raffle ticket at our office when you drop off your toys. (Employees and family members of AcuCare Total Health are not eligible for the raffle drawing.) Raffle winners will be drawn on Thursday December, 13, 2018 and will be notified by phone. **Cocoon is a delightful gift store located at 212 S. 3rd Street, in Geneva, Illinois. They are sure to have the perfect Holiday Gift for everyone on your gift list. The store is brimming with wonder and whimsy in the form of seasonal decorations, books, toys, candles, jewelry, scarves, purses and blissful fragrances for your body and your home. We’re so thankful for your participation in this event, as we share the spirit of the Holiday Season and open our hearts to the Elgin Community.